You asked, we answered. Welcome to our first ever listener requested episode where we dive into a wide range of topics from why certain markets aren’t great for eCommerce and what the best Shopify apps for analytics are, to whether Drew’s dreamy salt-and-peppered look is natural. The Oracle of Times Square, the man with all of the answers, Drew Sanocki of NerdMarketing.com is here to help answer listener questions. Andrew: Hey, you guys, its Andrew here and welcome to the eCommerceFuel Podcast. Thank you so much for joining us again on the show today. And today we’re going to be taking your questions, reader questions from the blog, from Twitter, all over the place. We’re going to be diving into a wide range of topics. And joining me via the Oracle of Times Square, the man with hopefully all the answers today, Drew Sanocki. Drew: Nice. That’s what I was going to say, the man with all the answers. Andrew: …of Nerdmarketing.com. Drew, how are you doing, man? Drew: Just glad to be here. Andrew: Yeah, and we haven’t done it yet, a reader question episode yet. I’m kind of surprised. Andrew: No. I don’t think we’ve ever done that. Drew: We’ve had episodes where we’ve talked about forum threads. Andrew: Forum threads, we’ve had a few spawned by questions from listeners and readers, but looking forward to doing this one. Drew: Soon we’re going to be doing live reader questions and answers, right? Drew: This is not live. They can actually call in with a question. Andrew: That would be cool. We may have to try that. I know a bunch of other places. They get a phone number and set up and…we’ll have to look into that, but in the meantime, if you’re interested in submit one the old-fashioned way, ecommercefuel.com/contact, or you can hit us up on Twitter on @youderian @ecommercefuel, or Drew, are you @sanocki or…why do I always forget yours? Andrew: Sure, that’s your Twitter handle. Drew: There is no @nerdmarketing. Andrew: Yeah, a little bit easier, but hey, let’s dive in. Enough banter. Let’s go ahead and get into your questions. I’ll dive into this maybe from my experience. Drew, you got any thoughts on the electronics market and eCommerce? Drew: I’m curious why is that common advice? Andrew: Not to get into electronics market? Drew: And typically you’re like a re-seller? Or is it don’t develop your own electronics product? Drew: So that’s how you’re making it work? Andrew: That’s how we’re making it work. And I think same thing happens, the big guys, Best Buy, a lot of these other re-sellers, they don’t make money on the big screen TV. They make it on the accessories, the warranties, the DVD, the $40 HDMI cable, that kind of stuff so. And then if you look at it on the manufacturing side, you can definitely make electronics, but depending on the complexity, that can also be pretty involved as well. So hopefully that helps. Not impossible, but it can be more difficult to do especially if you’re a re-seller. Andrew: Next question comes from Mark. Hey, Mark. “He says I’m curious about sales tax and the sales tax use forms that I need to fill out and return to distributors. My eCommerce business is based in New Hampshire, where no sales tax is charged.” Awesome New Hampshire, Montana is the same way. Love it. “Most distributors require re-seller certificates from all of the states. Do I really need to do this? Are all eCommerce businesses getting re-seller certificates from all 50 states? It seems crazy to apply for a business license from all of them.” Drew, thoughts? Drew: It certainly does seem crazy. I don’t remember doing that. This is probably where I got led away in handcuffs again. Drew: Have you heard of this? Andrew: No. Mark, I think something’s wrong. Usually a distributor, when I’ve dealt with this, they will ask for a certificate, a re-seller certificate from the state that I’m in, or the state that I have Nexus in or other offices, but I’ve never heard of one needing it from 50 states. That seems crazy. Drew: Yeah, at all. If you Google business Nexus and that will be due down this rat hole trying to figure out where your business is based, based on employees and contractors and all that stuff and warehouses. But if it’s online only and you’re based in New Hampshire, then I don’t think you need to worry about re-seller certificates from other states. Andrew: Yeah, definitely. And I’ve had people ask me for re-seller certificate, and Montana, I’m not sure issues one because we don’t have sales tax, so it’s not an issue. And so I think I just wrote up a letter along the lines of, “Hey, I’m only based in Montana, and we don’t charge sales tax. We don’t have these. I’m sorry. If you can, assuming, any sort of documentation you need, let me know, and that worked for my needs. Drew: So you recently had a daughter. Drew: You should play dumb with the IRS. Andrew:And if anyone does it, we will have you on the episode, on the show because that’s awesome. Drew: It could be a pet too. You don’t have to name your kid if your kids Nexus. Andrew: Probably a better, a safer route to go with. I did think about, if we had a son, I did flirt with the idea of naming his middle name Danger so he could legitimately say, especially when he’s older and he’s starting to date, his middle name is Danger. But all the women I spoke with thought that was a terrible idea. Most of the men thought it was a brilliant idea, and I wasn’t able to sell this well as I hoped to Annie. And Ryan, I think it’s a great question. We’ll link up in eCommerceFuel and the community to a couple discussions we have on business liability and how that works if you need the insurance. And I think technically, and this is something, Drew, I’d love to get your thoughts on this, I personally have an umbrella liability policy for my business that if somebody installs a CB radio and they miss wire it or it malfunctions and it burns their vehicle down, it burns their house down, their dog goes with it, heaven forbid. I’ve got a million-dollar plus policy that protects me against that. That being said, I think technically the person who’s technically legally liable for this, and again, I’m not a 100% sure on this, I’m not a lawyer, should be the manufacturer for any product defects and things like that. But that being said, we live in the US, people will sue anyone that’s even breathed or been associated with any part of a transaction. People do come after retailers for products that malfunction or hurt other people. So it’s something that you definitely have to be careful of and especially with archery or guns or things like that. I’m not sure about that. That’s something I…probably it’s a little more nuanced. I’d want to say that any reasonable court wouldn’t come after somebody for misusing a product like that, but that being said, I’m sure it’s happened. Drew: Yeah, I agree with you Andrew. I think Design Public, which is a furniture company, the manufacturers and the vendors had to do all the product liability testing, especially around cribs and things getting tested for use for kids. And all we wanted to do was have all their certificates on file so we had just general business liability insurance as you did, but as far as whether the product was dangerous or who’d be liable for that, we passed that on to the vendor. Drew: Yeah, I like to think in California, too, which is tough on that. But, yeah, it’s tough, the liability hoop you have to jump through. Drew: You should find someone else. Andrew: “…but I’m curious, is that a natural look, a God-given one, or is he doctoring it up somehow?” Drew, I’ll let you swing for this one. Drew: It’s a natural look. I started going gray in my 20s. My dad was completely white in his, let’s see, after 30 I think, he went white. So I got that in my future, but chicks dig it. Drew: And there’s not much I can do about it. I dyed my hair a couple times, and I’m allergic to hair dye. Andrew: Well, it’s probably a good thing, more beauty for Betty and others to enjoy. So, Sarah, I hope this isn’t offensive me reading this on air, but I was curious, too, so I just got to, lead vicariously through Betty’s question here. Drew, maybe I’ll tackle this real briefly and then turn over to you because you’re much more the analytics man than I am. Personally there is so much stuff in Google Analytics that I have not taken advantage of, that I don’t use any of these others. And I would guess, I could be wrong, but I would guess that’s probably the case for a lot of online merchants. So, well, I think there are some cases where things like Kissmetrics and some of these others maybe have some unique features such that Google Analytics might not be able to cover. I’d say make sure you’ve really dove into all the insights there before you go spending money on another analytics package that you may or may not spend the time to actually utilize properly. Drew: Yeah, I’ve seen so many businesses spend money on analytics and software, and they shouldn’t because they just don’t have their ducks in a row and just master analytics first. It’s free. You’ve got to just do some basic stuff around marketing attribution and make sure that all your campaigns are tagged properly. The last thing you want to do is not do that and go and spend money on some of these other packages because you won’t use it or the data won’t be not sound. So I would say master analytics first. Andrew: Is there a package out there that, let’s say, assuming that somebody has really exhausted and taken advantage of everything that just Google Analytics, the free version offers. Is there an analytics package out there that does have a compelling reason to use it to get even more actual insights versus what you get in the standard analytics from Google? Drew: Yeah. Another response to this question is like what do you want the…what are you looking to do? Because the packages that this reader names here, they’re all do slightly different things. Kissmetrics is more about customer lifetime value and trying to find which campaigns are best for customer lifetime value or drive high LTV customers. Some all I know is more about just creating a universal dashboard. So what are you looking to do? Are you looking to make your analytics more accessible to the whole team? And maybe you need something like SumAll that are you looking to get more of customer lifetime value, which is left out of Google Analytics, then maybe Kissmetrics, RJMetrics, and Castor or things like that would be a better fit. Andrew: Do you know, Drew, I should know this, can you import profitability data into Google Analytics? Obviously you can track product performance and go in and see what products convert the best and which ones I sell the most of in terms of revenue, but can you bring in cost data as well so you can optimize for profitability versus just top line? Drew: You can bring in cost data for your marketing campaigns. You can import, for example, Adwords. Cost data can go in there and you can manually import that or in Adwords’ case, automatically import it. I don’t think you can do it on a product level, so like a cost of goods sold for every product you sell. So that’s a limitation of analytics. You can’t get a lot of product margin and promotional data out of it. Andrew: That’s too bad because it is usually what a lot of people are trying to optimize for. It’d be cool to see that. Drew: Yeah, and the other big issue with analytics is you can’t really get down to the customer level. Everything’s aggregated. So in order to do some customer level analysis, like this specific customer was acquired through this specific marketing campaign, and he or she bought this, you can’t do that in Google Analytics. Andrew: So next question. “I know there have already been a few podcasts that touched have on international opportunities, but it would be really interesting to see a podcast regarding eCommerce stores serving markets outside the US. I’m currently starting a few shops in Chile, and there’s very little quality information from Latin America despite the fact that there are a mixture of national, people from Chile, and expats starting eCommerce businesses in the region. Still many untapped opportunities are available. We’d love to hear more discussion about this and do you have any thoughts?” From Levy. Thanks, Levy. Hey, it’s a really interesting topic. I was actually chatting with another entrepreneur here just last week or so about places like Canada, places like Australia, where there are much smaller markets, of course, than the US, but oftentimes they tend to be…the competition is just so much less because of those reasons. And so I think it’s interesting when you start thinking about like India and some places in South America. India, for example, I know there’s a couple places that are doubling down on eCommerce there. The problem there is logistics. You’ve got 20 languages spoken across the country. It’s trying to think through…package delivery is much more complex, and you wouldn’t like a developed nation like the US. That being said, I think there’s a ton of interesting opportunities there. I don’t know a lot about them but I would love to learn more, and if I ever saw a business in especially a place like Canada, Australia, or something that had some potential, I’d be inclined to take a serious look at it because I think there’s some pretty serious opportunities there. Drew, your thoughts? Drew: I think Levy is on to something. It’s just there’s huge opportunities outside the US because we have such a huge market here, a mature market that every niche has SaaS products and any eCommerce retailers targeting it, and you really, really got a niche it down whereas, he mentions Chile, you go to Chile. And I had a buddy who started a beagle in Santiago, and within two years, he had 50 beagle shops in Santiago. So he’s not really going out of the box. He’s just opening a beagle shop, like that was the first one, and now there are 50 of them. And they’ve got this emerging middle class all over Latin America that’s just ripe for things diapers.com and just basic, maybe like a Zappos or like basic eCommerce. I don’t know, one data, where you’re selling these good products online. And I think it’s a huge opportunity. I’ve gone down to Chile couple of times looking into it myself, but specifically as far as getting more information on it, I don’t have any good resources. So maybe Levy should go start the podcast on doing business in South America. Andrew: Love it. If anyone is listening and you’ve got a business in Latin America, in India, in maybe out…place that traditionally isn’t…that where an eCommerce is still very much evolving and growing, let us know. Tweet at me @youderian or again through our contact information, let us know. I’d love to hear from you and learn more about it, and potentially, yeah, if it makes sense, get some more information to people and do a write-up because it’s something that I’ve been curious about, too. And Levy, I’m sorry. I don’t have better information for you. Drew: I think if I were single and didn’t have kids I would be all over this. I’d probably move to South America and try to start eCommerce companies. Andrew: Yeah, that’s a good point. It’d be a lot of fun as a single guy. Yeah, a little trickier with the family, but what do you think? Maybe you could take a little six months, 12 months sabbatical, get something running, and then come back to New York and let someone else run it. Drew: Yeah. I don’t know Spanish. Andrew: Drew, you dive into the details of this one for me. Drew: Yeah, Andrew user fan. In terms of how it worked on a logic based side, we leveraged Shopify’s tags, their tagging system and so it would go through, and based on the tags we assigned the product, it would shoot people to the proper place for search filters. So tag if people selected it. Let’s say a 2006 Jeep Wrangler. It’d go through and look at the tags and pull the right things up. So we jerry-rigged it a little bit. I created using an existing functionality to allow it to work. Some of our products have, oh man, 20, 25 tags on them, but it works well and it’s customizable for our needs. Drew: No, unfortunately I don’t. Andrew: I can’t…I’m not sure we looked into one but it’s a long, very long answer. I’m rambling, but a long answer as we did in-house with Shopify’s tags at the heart of engine. Andrew: So next question. 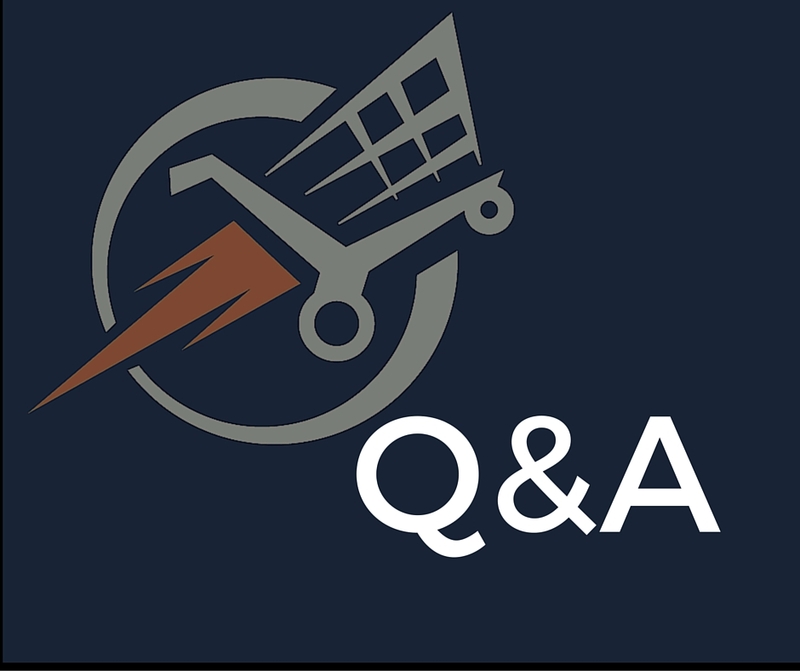 “I have a successful eCommerce store but it’s a relatively small niche. But I would like to expand and grow. Do you think it’s better to start a store with multiple product lines or stay focused on one particular niche? For example, let’s say I sell pottery. Is it better to just stick with pottery or will it be better to sell pottery and other handmade or household products to allow room for expansion? I want to have the best chance of success without limiting my future growth, but I also don’t want to dilute my expertise on a certain product line or market. What are your thoughts? Saeed.” Drew, why don’t you take us? Why don’t you lead us off on this one? Drew: Well, I think you want to have an offering where you can get an up sell or cross-sell. Or ultimately a second purchase from your customer, so I would think about it that way. And you know pottery better than I do, but are there related products you can use in either checkout to up sell somebody or to market to them a month or two down the road to get a second purchase? So I would consider adding more products in the context of that customer journey. Andrew: Did you at Design Public, did you guys, and you’re a little bit broader. You’re kind of home fashion and furniture, so you probably had a lot of room to expand. Did you ever try to expand too broadly with a product line or kind of a sub-niche and after a period of time you’re like, “Ugh, this is really just not working”, and had to back away from it? Drew: Not really. I think if we had gotten into apparel or something, that would have been a little bit broad, but for the most part, we stayed within furniture and home products. So it wasn’t really an issue. Andrew: We tried that on the radio side. Obviously we do CB radios and handful of years back we tried to expand into marine radios. And so marine radios, different bands. People are using them on the water and in boats instead of on the roads. And it did not go particularly well. Well, nothing terrible happened. We just mostly wasted a lot of time and energy trying to integrate products in and we just sold almost nothing. And it’s hard to say if that was because we really didn’t double down and market it like we should of. I will say from a merchandising standpoint, there was confusion when people would come on the site and then there was marine radios and CB radios and they don’t work together and the components didn’t work together and they were for different needs and we didn’t have an amazing UX flow from the beginning that guided people to what they needed, so there’s confusion there. And we didn’t know them as well. So for us, we tried that, and it was difficult. That being said, this is probably an extreme case where the differences between product lines are probably a lot more severe. And if you get them wrong there, harder to understand and can cause problems if you were in the wrong products. But, yeah, I’ve had problems with them in the past. So I don’t think there’s a cut-and-dry answer to it. I think it really depends on your niche, how much room, how similar the products are, how likely people that are going to buy your main niche are going to actually also want to buy the secondary products you offer, and how easily you can distinguish the two lines or the multiple lines. Drew, that’s it. I don’t have any more fictitious questions to try to embarrass you. Andrew: If you’ve got a question, again, ecommercefuel.com/contact. You can tweet at us @drewsanocki or @youderian and we’ll try to do another one of these episodes in the future. Drew, do you know we’re on episode…This is…we’re like a 120 plus episodes into this thing. Drew: What are you going to do at 200? Andrew: I don’t know. I thought I was going to do something exciting at 100, and then we just rolled by, and it took me a month later. I said, “Oh, I guess we’d celebrate when we hit 100.” I really didn’t do anything for it. Drew: What is it for me? It’s got to be like 20 or something. Andrew: Oh, you’ve got to be at least 20, 25 episodes or so. Drew: You should just have this massive celebration at 30. Drew: You’re like 253 and I’m at 30. And it’s just all about the 30. Andrew: I love it. We were talking about this earlier where, of course, Bill is the other very regular co-host that hops on and you guys had never met each other until eCommerceFuel Live, which I just…I can’t believe. Drew: Yeah, it was great to finally meet him. Drew: Yeah. I heard Bill and I started our own podcast. Andrew: …people would flock to you in droves. I might be lucky enough to get another five or six episodes before I just quit from the depression. Drew: No one leading the conversation. We just don’t think…yeah. Andrew: Oh man, but it’s crazy, this ritual where the world we live in you can make all these relationships and meet many people, but we should do one. We’ll have to do one where three of us hop on the horn sometime. That’ll be a lot of fun. Drew: Yeah. Bill said he’s going to be in New York soon. So maybe you could do one with both of us. Drew: He and I in the same studio here in New York. Andrew: I love it. I’ll be remote. We can all dial in together. It’d be a ton of fun. Drew: Andrew, I don’t have to be fun. We’ll see. Andrew: We’ll make it happen, one way or another. So thanks for your questions everyone. Thanks for listening in. Drew, I appreciate it as always. Drew: Yeah, this was fun. Andrew: That’s going to do it for this week. 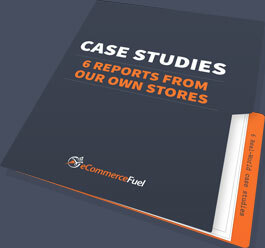 If you enjoyed the episode, make sure to check out the eCommerceFuel private forum, a vetted community exclusively for six and seven-figure store owners, with over 600 experienced members and thousands of monthly comments, it’s the best place online to connect with and learn from other successful store owners to help you grow your business. To learn more and apply, visit eCommercefuel.com/forum. Thanks so much for listening. Another great episode Andrew & Drew, thanks very much. I’d like to chime in on the question of Analytics. Google Analytics is what I’d call a click stream analytics package (tracks every individual clicks on the website), and you absolutely NEED a click stream analytics tool on your site. That’s most commonly Google Analytics, but the other options include Adobe Analytics (formerly Omniture), IBM Analytics (formerly Coremetrics), Webtrends, or Clicky. Given that Google is mostly free and awesome, it’s the best choice for most sites. As Drew pointed out, other tools KissMetrics, RJMetrics, Vantage, SumAll, GoSquared (and many others) don’t really replace the need for a clickstream tool. I’d definitely recommend any site start with a click-stream tool, and I’d probably invest in people to get the most out of Google Analytics before I spend money on other tools. Buy a book (http://www.webanalytics20.com/), take a class (http://www.annielytics.com/blog/analytics/, http://www.marketmotive.com/web-analytics-training-courses/, lynda.com), or even hire an analyst. Google Analytics actually does track all the behavior of individual users. Google upgraded to “Google Universal” several years ago, and if you’ve upgrade your tags to universal, you now have a “user id” for every user that references all their activity (across multiple sessions, channels, and devices). The rub is that you can’t store personally identifiable info (PII) in Google Analytics, so you need to store your Google User ID’s in your CRM (Salesforce.com, SugarCRM, or even in your Shoppify User Account table). Google Analytics added a bunch of e-commerce extensions last year which are very powerful and helpful for e-commerce sites, and this year they added calculated metrics. You can absolutely upload product cost data into Google Analytics, and use gross margin contribution, or profitability as a metric in Google Analytics, as well as calculate Customer Lifetime Value. The rub is that many of these useful features require improvements to the default implementation (upgrade to universal, enablement of e-commerce, integration of data from other systems). So generally I’d suggest sites focus on improving their click-stream tool rather than buying another tool. When you really are ready for another tool, one area that click-stream tools are not good at is showing us behavior on the page. IE they see what users click on but not what they do before their click. Often you’d like to know how far down the page they scroll, where they move the mouse before clicking, etc… ClickTale, CrazyEgg, or HotJar are great examples here and I think they all have reasonably useful free versions. Hey Jason! Thanks for tuning in, and apologies for not getting your comment posted earlier here on the blog. It got stuck in a moderation filter for some reason. Fantastic info on analytics, and really good to know it’s possible to bring in profit metrics into Google Analytics. Am excited to dig more into this now that I’m aware of it….. Funny, I actually just spent the morning setting up HotJar on a site for a number of the things you mentioned – session recordings, surveys, heatmaps, etc. Pretty impressed with the tool and especially for the price, have been a user since the Beta rolled out but it’s the first time I actually get to play around with the entire suite.